Ref. 16610 LV ?50th Anniversary? Rolex, Oyster Perpetual Date, "Submariner 1000ft =300m? Superlative Chronometer Officially Certified, Ref. 16610 LV with green bezel. 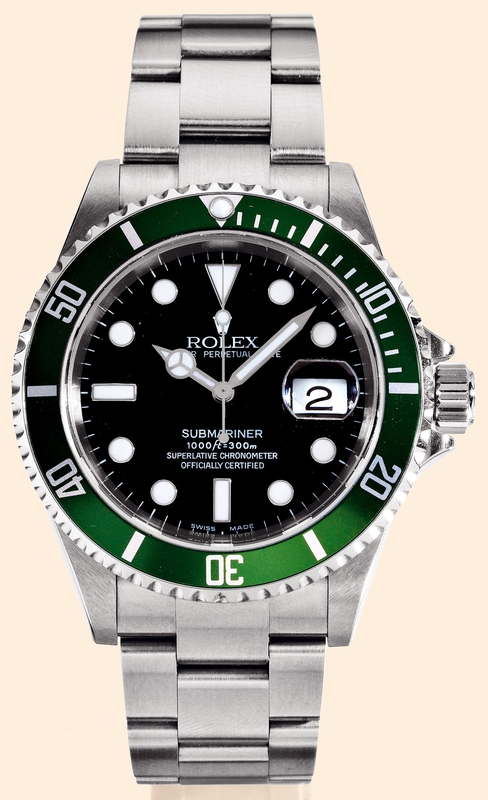 Especially made in 2003 in a limited number to commemorate the 50th anniversary of the ?Submariner? model. Very fine and very rare, tonneau-shaped, center-seconds, self-winding, water-resistant, stainless steel gentleman's wristwatch with stainless steel "Fliplock" Oyster bracelet. Accompanied by a fitted box, a Rolex anchor, and a certificate. C. Three-body, polished and brushed, screwed-down case back and crown, graduated revolving green bezel for the decompression times, "Triplock" winding-crown protected by the "Crown Guard?, sapphire crystal with "cyclops" lens. D. Black with luminous round, triangular and bâton indexes, aperture for the date. Luminous "skeleton" hands. M. Cal. 3135, rhodium plated, ?oeilde- perdrix? decoration, 31 jewels, straight line lever escapement, monometallic balance adjusted to temperatures and 5 positions, shock-absorber, self-compensating Breguet balance spring. Dial, case and movement signed. Diam. 40 mm. Thickness: 13 mm. Approx. overall length: 190 mm. C. Three-body, polished and brushed, screwed-down case back and crown, graduated revolving green bezel for the decompression times, "Triplock" winding-crown protected by the "Crown Guard, sapphire crystal with "cyclops" lens. D. Black with luminous round, triangular and bâton indexes, aperture for the date. Luminous "skeleton" hands. M. Cal. 3135, rhodium plated, oeilde- perdrix decoration, 31 jewels, straight line lever escapement, monometallic balance adjusted to temperatures and 5 positions, shock-absorber, self-compensating Breguet balance spring. Dial, case and movement signed. Diam. 40 mm. Thickness: 13 mm. Approx. overall length: 190 mm.